In Matthew 3:13 we read, "Then cometh Jesus from Galilee to the Jordan, unto John, to be baptized by him." This is remarkable, and we are going to ask the question; “Why was Jesus baptized?” and try to answer it. There may be several answers, but the primary reason is stated in the passage. “For so it becometh us to fulfill all justice.” Jesus is identifying Himself with sinful mankind. Isaiah had prophesied that He would be reputed, numbered or counted with the wicked. Understand that Jesus was holy, harmless, undefiled, and separated from sinners. He was baptized to completely identify Himself with humanity. There is a second reason for the baptism of Jesus. At this time He was set aside for His office of priest. The Holy Spirit came upon Him for this priestly ministry. Everything that Jesus did, His every act, was done by the power of the Holy Spirit. “Him, who knew no sin, He hath made sin (made a sin offering) for us, that we might be made the justice of God in him.” (II Corinthians 5:21). There was sin ON Him but there was no sin IN Him. My sin was put ON Him, not IN Him. That is an important distinction. As the Catechism of the Council of Trent has said, Johns Baptism and the Sacramental Baptism we have received are not the same thing. But we must understand that through our water baptism, we are saved by being identified with Him. We identify with Him in baptism. Even Saint Peter our first Pope, says that we are saved by baptism. In what way? By being identified with the Lord Jesus. To be saved, is to be in Christ. How do we get into Christ? By the water baptism of the Holy Spirit. Let me repeat some of what I have already said. 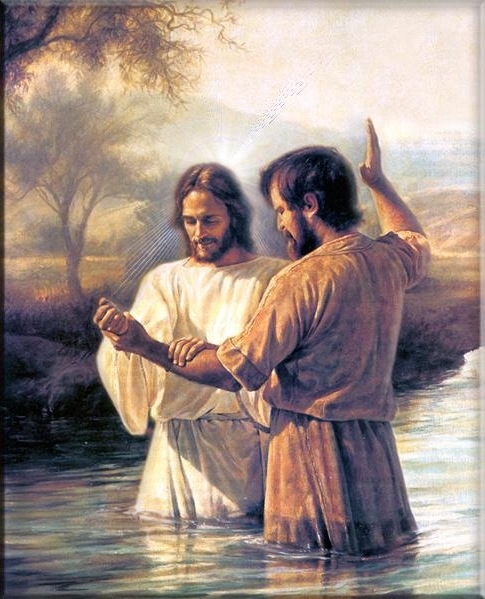 The Church teaches that by water baptism we are identified with Christ. The Lord Jesus said, “... him that cometh to me, I will not cast out.” (John 6:37). We must recognize that we have to be identified with Christ, and that is accomplished by the Holy Spirit baptizing us by water into Christ, hence into His body, the Church. One time an old salt said to a young sailor in trying to get him to accept Christ and be baptized, “Young man it is duty or mutiny!” You must come to Christ and be baptized because it is a duty. If you do not, it is mutiny! Please take the time to read, study, and meditate on Romans 6 as well as I Corinthians 12:12-13. Now let me read again Matthew 3:16-17. And Jesus being baptized, forthwith came out of the water: and lo, the heavens were opened to him: and he saw the Spirit of God descending as a dove, and coming upon him. And behold a voice from heaven, saying: This is my beloved Son, in whom I am well pleased. Here we have a manifestation of the Trinity. As the Lord Jesus is coming out of the water, the Spirit of God descends upon Him like a dove, and the father speaks from heaven. The Father says, “This is my beloved Son, in whom I am well pleased.” the Lord Jesus Christ, the King of Kings, is now identified with His people. In our next lesson, Lord willing, we will study the threefold temptation of Jesus.